Don't expect to see construction equipment soon at the big, polluted site at Third Avenue and Third Street where Whole Foods is planning to build a large grocery. Our friend Gabby Warshawer at Brownstoner has been talking to state officials and found that it could be a while. While the cleanup plan for the toxic-laden site has been approved, she reports that the Department of Environmental Conservation is "still reviewing Whole Foods' application to build on a wetlands...Whole Foods must prove that the store's location next to the canal won't adversely affect the general public and that the supermarket won't harm the canal by virtue of its existence next to the waterway." There is so much irony laced throughout the Whole Foods Gowanus proposal from building a store on a floodplain that will be mostly underground to selling organic produce from a site laden with toxins that it's almost impossible to know where to start. So, which will come first: a full blown recession and a decline in the real estate market or the start of work on the much-delayed store? 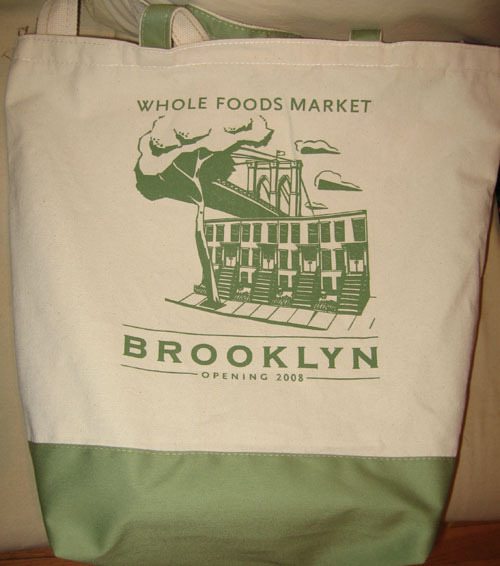 Remember the tote bags Whole Foods was handing out last summer at Celebrate Brooklyn that said "opening in 2008"? Why doesn't Whole Foods consider making a store in that old Power House building on the once hoped for Gowanus Village site? The structure is there now, though a good cleanup is needed.